I arrived in Sydney from UK in 1963. In those days in Australia ladies seldom sailed, and the only racing dinghy that was suitable was the Heron. 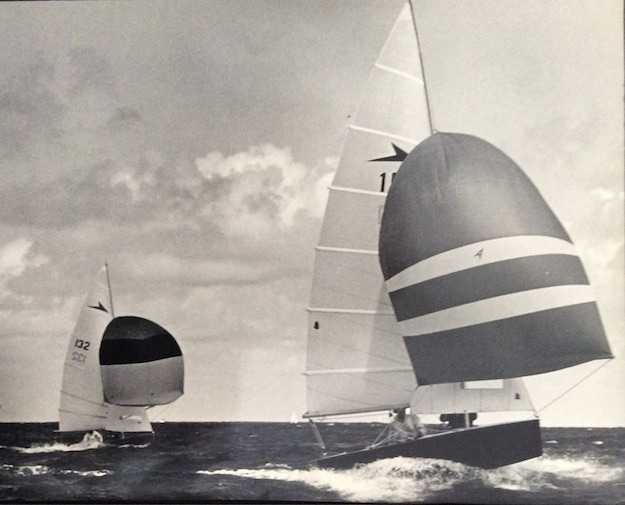 My wife and I had raced National 12’s for some years in UK, and were not greatly attracted to the Heron, so I sailed a Finn and ocean racing yachts in Sydney in 1963/64. My wife soon got tired of this, so something had to be done. Fortunately by then the NS14 (Northbridge Senior) class had been launched by Northbridge S C, led with great enthusiasm by Frank Bethwaite and many others, so effectively that it’s numbers grew rapidly. It was a development class aimed primarily at husbands and wives, very good performance, without trapeze and spinnaker. In fact very similar to the 12 footers we were used to. I bought a hull, rigged it like a National 12, and won the next two NSW titles, and many other races as well, having joined the Western Suburbs SC, as I lived close by. 1965/66 was the first season of racing NS14’s at the club, starting off with 6 boats, increasing to 15 by the end of the season. Leading skippers were Brian Holz, Buster Brown, Ray Sim, and George Davenport. Several new members had migrated from NSC, preferring the more open waters of Middle Harbour to the somewhat flukey conditions at Northbridge. After the end of the season the club ran a very successful winter series of 6 races – the entry fee was 3 shillings per race! I joined MHASC for the 1966/67 season, which commenced with 20 boats growing rapidly to an amazing 30 by the end of the season, including Garry Fogg (top sailmaker), Terry McGreevy, David Rose, Kevin O’Neill and many other top sailors. By this time MHASC was the NS14 club to join for top racing. We regularly had 5 or 6 in the top 10 in NSW (and later National) Championships – I won my third title in 1967. At this time Dr Robert Dey was Commodore, George Davenport Vice Commodore, Barry Clarke Secretary, and Vic Friezer Class captain. Club members were active on the committee of the NS14 Association, including myself as Secretary, and later George Davenport as Vice President, later President from 1970 thru 73. 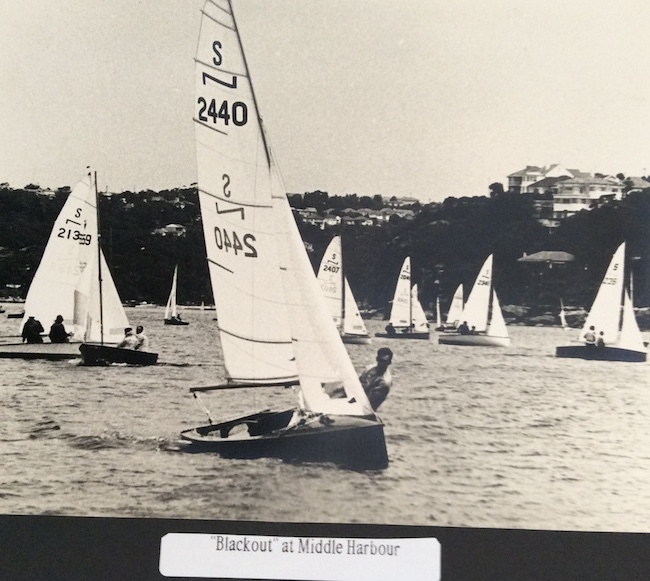 During this period MHASC hosted a successful NSW Championship, and were also active in promoting the class in other states – Barry Clarke and I took an NS14 to Melbourne for a Black Rock Icicle handicap event in mid-winter which we won from around 100 boats. The clubs strength continued well into the 70’s with around 30 registered NS14s, of which 15 -20 would race every week, with continuing success in major events. There was great club camaraderie, with after-race BBQ’s and regular social events. There were changes afoot however, as always. Due to the NS14 being a development class, with the rules allowing quite wide variations in hull shape and rigs, sure enough development took place! Frank Bethwaite and others were at the forefront of improved hulls, rigs and techniques, which had the effect of making the boats somewhat sensitive to crew weight, causing a number of (overweight??) husband and wife teams to become disenchanted with the class and look elsewhere. A perceived alternative was the NZ Javelin class. The Javelin was/is not a boat for husbands and wives – 14 ft with spinnaker and trapeze, it was not a direct replacement for the NS14 for those couples who wished to sail together (the Tasar which came along a bit later filled this bill nicely). It did appeal to a number of younger sailors who wanted more excitement than an NS14, plus some NS14 skippers whose wives no longer wished to sail. A group within MHASC, decided to build boats and the club adopted the class commencing (I believe) in the 1972/73 season. Among those who joined the class were Kevin O’Neill, Mark Tolhurst. Tony Levett, Alex Dey, Mark Rourke, Russell Walker, and myself a year later. We enthusiastically promoted the class, and in December 1975 we hosted an Interdominion Championship for Javelins, with some 6 boats coming over from NZ. In spite of the success of the event, the class never really grew in NSW and faded out of the club a few years later. (The Javelin did catch on in Victoria and WA with good fleets racing). NS14s still continued to provide good racing, albeit with smaller fleets, which by the 1976/77 season had diminished to about 10 boats – Elton Squires was Class Captain at this time. Another interesting, but eventually unsuccessful, development took place in the mid 70’s – the Senior 14 class. This was envisaged by a group of NS14 husband and wife sailors who wished to continue sailing together, but felt uncompetitive in NS14’s due to weight. Led by David Rose. Ray Sim and Terry McGreevy they designed a one design boat with a 14ft chine hull, rather more sail area than the NS14’s 100 sq ft, and built a mould from which many boats could be built. They commissioned Triton Yachts to turn out the glass hulls, which the owners completed themselves. I think 8 or 10 were built, and for a while provided good racing at the club, but for reasons which I cannot recall, the class did not flourish, and eventually died – never to be heard of again. The first Laser appeared at the club around 1976/77, and steadily increased in numbers, aided by the fragmentation of the NS14 and Javelin fleets. I had ceased to sail NS14’s from end 1973, having built a Javelin, which I sailed with Barry Clarke for a couple of seasons. Due to business commitments I was unable to sail as regularly as before, and later bought a Laser when they became adopted by the club. I was not able to race regularly, and eventually left the club in the late 1970’s. By then the NS14’s had virtually died, and MHASC again became a one class club.